$8,279.99 each List: $13,704.00, You Save: $5,424.01! Hand-Hammered Copper Bowls: made from a single piece of copper without any seams, the bowls are then hammered by hand. Sound waves will slide off of smooth surfaces, but the internal bumps give the bowl enough texture to keep sound waves bouncing around inside, giving you a fuller overall sound. Dresden-style Pedals: these pedals have a clutch-lock mechanism that allows the pedal to be mechanically locked in place when not in use, keeping the pitch of the drums true. In the past this was done with a ratchet involving intermeshing metal teeth, but this is not the case any more. A special split rocker arm system eliminates the extra tension usually found at the high end of each drum's range. Fine-Tuner: a hand crank within easy reach allows the timpanist to finely tune the pitch when just slightly sharp or flat. 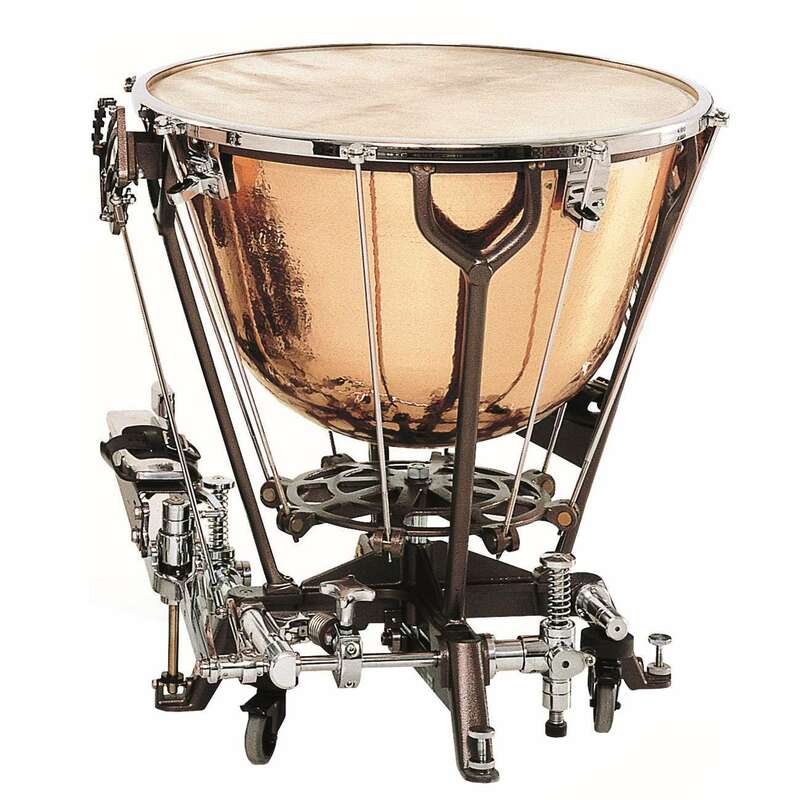 Spring Balance Mechanism: this device, located on the back of the drum, can be adjusted so that the 'feel' of the pedal remains the same across the entire range of the drum. Low-range changing will not feel so sloppy, and high-range changing will not feel so tight. Strong Struts: the simple, sturdy struts on this instrument will keep anything from warping or bending due to strain. Wheel System: two-way locking will keep the drums from ever moving around during performance. The spring-loaded pistons behind the wheels easily tilt the drums towards the player and keep it from wobbling, and are easily engaged and disengaged with your feet. Precise Tuning Gauge: a unique ball-and-socket system removes all bindings normally associated with tuning gauges, giving you very precise readings. The letters themselves can be moved by loosening the thumb screw, and when tightened will not make any rattles. Wooden Head Protectors: these felt-lined head protectors come standard with any Philharmonic Light drum, and can be locked in place with the timpani key (included).